Alcatel is one name you are probably not used to seeing in the States, but the brand is somewhat popular on the other side of the pond, and at MWC it has unveiled the One Touch Snap family, couple of interesting Android-based smartphones, including an LTE device for wider audiences. The Alcatel One Touch Snap (version with no LTE) is based on a 1.2GHz quad-core MediaTek processor and 1GB of RAM, features a spacious 4.5-inch qHD screen, and has 4GB of internal storage. It runs on the latest Android, 4.2 Jelly Bean. There is an 8-megapixel rear camera capturing 720p video and a 2-megapixel front-facing shooter. Those put it deep in mid-range territory where there is an ocean of Android devices. 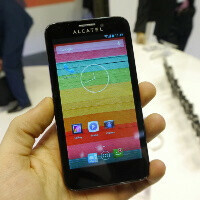 Luckily, there is another, LTE version of this device, logically named Alcatel One Touch Snap LTE. The OT Snap LTE runs on a 1.4GHz dual-core Snapdragon which is probably there because of LTE. The screen is a tad larger as well at 4.65 inches. The two devices definitely felt plastic and unimpressive in terms of design, another bunch of generic designs. Android on them felt pretty snappy, working with no visible lag - something that we are seeing massively in Jelly Bean devices and we’re honestly so happy Google fixed. Alcatel has made the two devices available in China right now, and plans to launch the One Touch Snap in Europe around April. The Snap LTE should arrive globally in July 2013, with no word on US availability. No matter how snappy the phone itself might look, the Alcatel logo makes it look cheap.